When adding attributes to vegetation items, follow these rules. Forests and sparsely wooded areas and areas occupied by trees and shrubs located outside of localities. Sections occupied by trees and shrubs on vacant lots, or on city blocks without buildings or only with “Utility or storage” buildings. Park, square — named and un-named parks, squares, and forest parks. The outlines of named items either coincide with their associated administrative divisions or are drawn in accordance with the situation in that particular area (for example, they might follow a fence line). A vegetation polygon may contain other sections of vegetation (such as woodlands or lawns), or it may contain items that exist independently of it (such as reservoirs, lanes, squares, buildings, etc.). See also point 3.9.1.5. Draw un-named parks and squares if they are items with clearly designated territories (for example, if they are bordered by roadways) and are not located within building blocks. Urban vegetation — sections of trees, shrubs, and sod on city blocks with buildings (within localities). Sections that are completely covered by grass that relates to the “Lawn” type; if there are bushes or trees on the territory (even if it's a small section of it), label it as “Urban vegetation”. Nature reserve — protected nature areas of all types: national parks, nature reserves, wildlife sanctuaries. The item polygon coincides with its administrative division. Draw lawns on the territories of localities, as well as those on the territories of large organizations outside of cities. Garden — territories occupied by fruit or decorative trees and shrubs that were planted by humans (including vinyards). 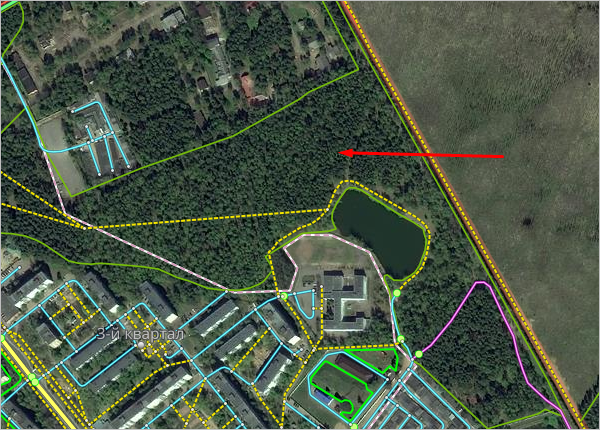 Plants on the territories of individual developments should be assigned to the woodland type “Urban vegetation”. Draw the item polygon based on the physical border of the section containing that type of vegetation. See also point 3.9.1.5. Cemetery — territories that are designated for the burial of the deceased or the internment of their ashes after cremation. This includes official pet cemeteries. Territories containing free-standing graves or monuments to the dead (such as the tomb of the unknown soldier) are not considered “cemeteries”, but you can draw them on the map as Locations. 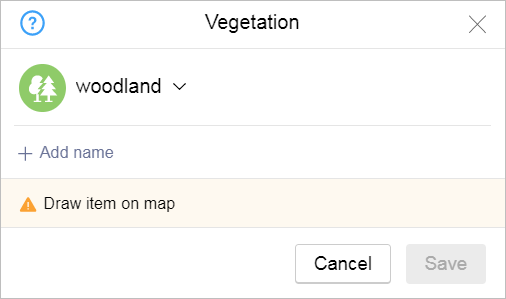 Assign vegetation item names in accordance with the general rules (see 3.1.3. Map item naming rules.